The Raveonettes have been one of the most underrated bands in the alternative music scene - 'Lust Lust Lust' (my album of 2007) was critically lauded and they’ve consistently delivered strong pop singles. So why are they not playing in the indie’s premier leagues but confined to the status of landfill bands such as The Pigeon Detectives? Much of this is down to 2005's 'Pretty In Black' which brought the momentum built up by their debut, 'Chain Gang Of Love', to a shuddering halt. Releasing their fifth album, 'Raven In The Grave', The Raveonettes remain in thrall to Jesus And Mary Chain and Phil Spector but there is a darker-than-usual undercurrent, which takes in 80s goth leading to a gloomy, romantic record that recalls the atmosphere of early Cure. Disappointingly, their signature sugary harmonies get lost in the production, which is helmed by the band themselves. The other by-product is a lack of quality control and given the brevity of Raveonettes’ records, the negative impact of each filler track is all the more damaging to the record. The album kicks off strongly with 'Recharge & Revolt', which is very much the exception with its upbeat tempo, underpinned by a gorgeous synth line. Clocking in at over five minutes, it’s one of the longest songs the band has ever released and the record is stronger for it, adding a depth which is missing elsewhere. It’s followed by 'War In Heaven' which is characteristic of the album’s deficiencies – the song feels far too much in the band’s comfort zone, exemplified by the annoying repetition of the same three lines throughout the song. The beautiful 'Forget That You’re Young' gets the album back on track as Sharin Foo coos sweet nothings over a wondrous melody. Regrettably, the duo fail to build on this as the majority of subsequent tracks are overpowered by the reverb and the lyrics begin to verge very close to careless, such as "When I'm down/ and most of all I've had / has come to get revenge on all I've done" ('Evil Seeds'). However, there are two tracks which shine through. 'Ignite' is classic Raveonettes, while album closer 'My Time’s Up' is a wistful, slower song which ends the album on a high note. 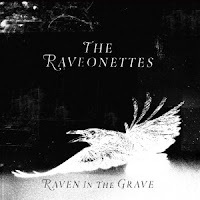 A frustrating release given there are moments on 'Raven In The Grave' which rank among the best in The Raveonettes' career. It’s vital that they add more variety and substance to their next record. Hopefully this isn’t the start of a career decline. Grab a free download of 'Forget That You're Young' here. Purchase 'Raven In The Grave' at your local record shop, iTunes, Amazon.co.uk etc.